To whom it may concern:Everyone wants to belong. Everyone wants to have friends. Everyone wants to fit in. For some, this comes naturally. For others, they struggle to the point it can affect their mental health. What is the difference? Well, there is no one answer to that, but positive protective factors such as a properly stocked “emotional tool box” can definitely play a big part. We also know that the world is changing faster than many of us can keep up. The image media sells us as the ‘ideal’ image has changed over the years. And so too has the number of times we see those images on a daily basis.So what can be done? There are many different ‘tools” we can put in our toolbox and seeing a Nicole Clark “Cover Girl Culture” presentation is definitely a “multi-use” tool for sure!We had the great pleasure of hosting a week-long series of cover Girl Culture presentations in our region this past April. 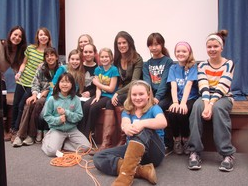 Nicole traveled to our rural area on a veritable “road trip”, visiting 9 schools in 5 days. The audience varied from a small group of Grade 6 to 8 girls to over 400 male and female high school students. Each time, Nicole delivered the consistent message of how to be a media renegade and how to have ninja self-esteem.We continue to receive positive feedback from these presentations as well as requests to have her return to the area to visit to make additional presentations. Although it wasn’t the intended message of the presentations, helpful discussions also took place about eating disorders before, during and following the presentations. This was an unexpected result but very much an appreciated one. Teachers and school guidance counselors continue to email us with reports of students who have approached them since to disclose about their body image struggles and as a result, in many of the cases, the students have been able to make that first step on the road to recovery. 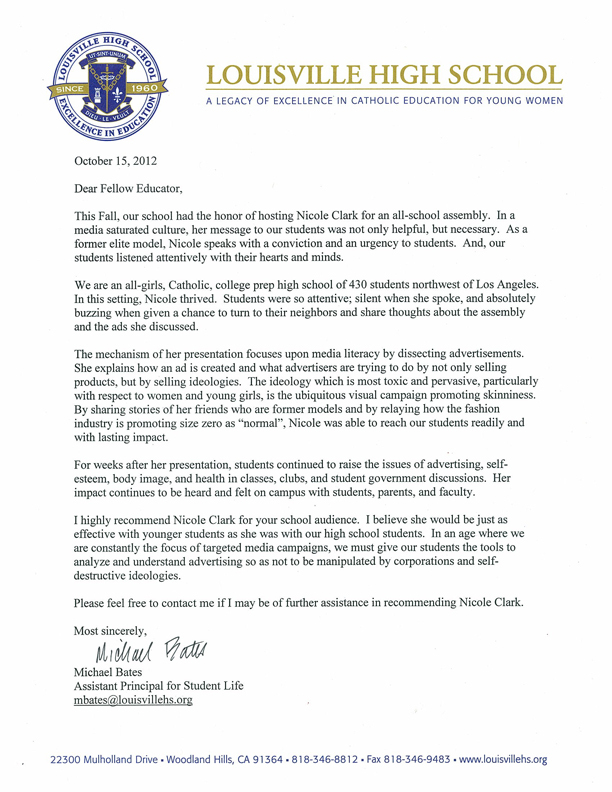 As an additional sign of how well the presentations were received, our local public school board ordered a set of the Cover Girl Culture workshop DVDs for EVERY high school within the board, whether they hosted a presentation or not.Personally, I appreciated the message Nicole brought to the girls in our area. As someone who visits schools daily, spreading the message of what is good mental health, how important it is to have it and how to achieve it, I was totally impressed with Nicole’s presentations. Her manner was completely professional. She was flexible with any situation she encountered. She fielded questions and responses from the audience with ease and poise. In fact, I was so impressed with Nicole’s presentations, after her visit, I forwarded her information to all my colleagues across Ontario who do similar work.I truly hope you follow through with your interest in booking Nicole Clark to come to speak to your youth via her Cover Girl Culture presentations. The learning will be so valuable and have positive ramifications for a long time to come. Please feel free to contact me at the contact information listed above for a more detailed reference if required. see…… We’ve stayed in touch with Nicole since her last visit, have kept ourselves up-dated about the wonderful work she and her husband continue to do in California and are very impressed with how “far-reaching” her work has become. May 2012. –Ann Martell, Psychological Associate at the Bluewater District School Board, Owen Sound. 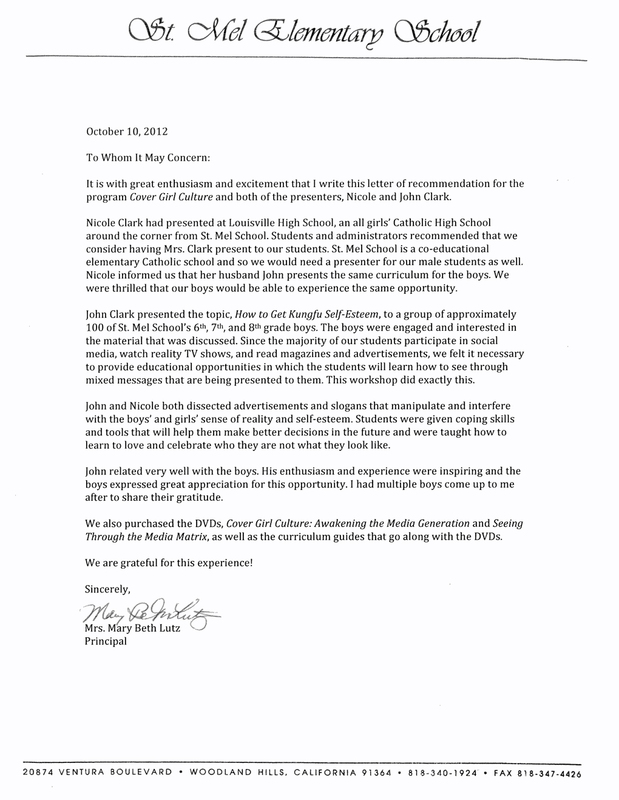 As a Catholic educator, we are always looking for guest speaker’s whose expertise and experience can enrich and enhance the experiences of students. I would like to thank you for your wonderful presentation on the negative impact of advertising on the self-esteem of young women. Students appreciated your insights into an industry that seeks to profit from the vulnerabilities of young women, as well as your critique of a culture that portrays a very negative stereotype of the image of women. Much discussion has ensued, and the critical thinking skills that educators seek to inspire and help facilitate was also ignited in the students. Many girls have been awakened to the invasiveness of consumerism but also the persistence of sexism. The boys also were seriously impacted about the role that men play in perpetuating these negative images. The sincerity of your message will continue to have a positive impact on the young women and men who heard your words as they continue on their journey to becoming adult members of our community. Tara Warren Vrbanac, B.A., M.A., B.Ed. PARENT: (anonymous)”Good morning Nicole…You don’t know me…but you were here Friday December 2nd, and spoke to my daughter’s class (at Sacred Heart School) I just wanted to let you know that the last year has been a year like no other. At the age of 11, my daughter was diagnosed with Anorexia, and this put our life into a complete tailspin…she was hospitalized, near heart failure. Never thought in a life-time this would be our struggle, yet at 11yrs old. There has been a lot of talk in the school yard last year about weight and the girls wanting to be skinny…then this awful disease took my daughter for a year. Anyway, my daughter is a fighter, and fights every day, and I believe we are winning. I encouraged her to talk to you, and told her to be confident and share her own journey, as she still does not like to talk about it ( it is still the “secret” illness in our society)I just wanted to let you know that you are doing GREAT work…my daughter cannot stop talking about how positive your talk was, and you have inspired her to continue fighting and someday, empower other girls that may struggle. I firmly believe that one day, she will help others given her journey. As a parent, you have made a difference to my daughter and I thank you for taking the time to visit the school and tell your story and mission – you may never know the impact you have had on her, but you made a difference, and for that…I thank you.